Order within 7 hours 15 minutes for Same Day Delivery! 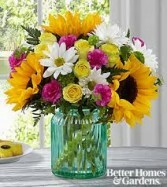 Sending bright, cheery flowers from PETALS, FLOWERS & MORE is a beautiful way to express what's on your mind and in your heart. 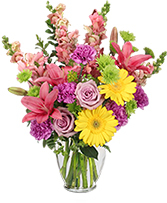 Order this floral arrangement on our website or call PETALS, FLOWERS & MORE direct and we'll surprise someone with a fresh flower bouquet today! 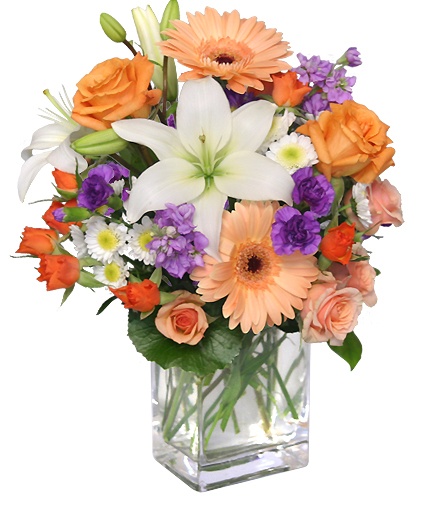 Rectangular Vase, Foliage: Galax Leaves, Salal, Peach Gerberas, Deeporange Spray Roses, Peach Roses, White & Green Button Poms, White Asiatic Lilies, Purple Moonshadow Mini Carnations, Peach Spray Roses, Lavender Stock. Flowers can bring a smile, give you comfort or make you laugh, and now is a great time to send some to the ones you love. 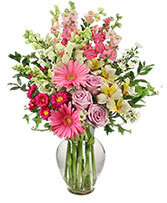 Call PETALS, FLOWERS & MORE direct or order beautiful blooms now from our website.